Your realtor has found your dream home at last, your offer to the seller has been accepted, your loan officer has confirmed that your mortgage agreement is in place, and you’ve got the down payment ready. It’s all been leading up to this. Finally, you’re approaching closing day! 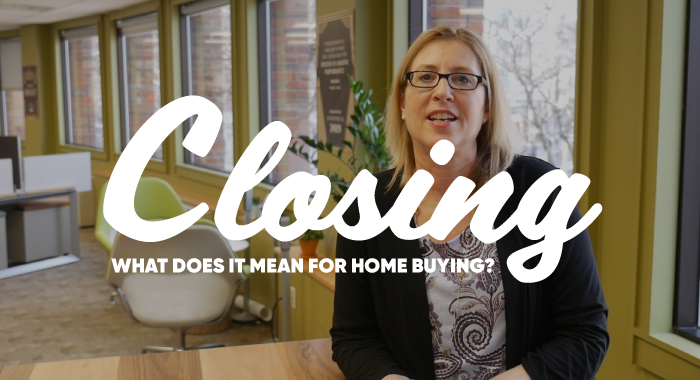 But, what does it really mean to “close” on a house? Here’s a rundown of what you should expect. Between your pre-approval for a mortgage and your closing date, you should avoid taking on new debt or negatively changing your credit score in any way. Any change to your credit report can send your mortgage agreement right back to the drawing board. A few days before the closing you’ll make a wire transfer of both the funds for the down payment and the closing costs to your attorney. Your lender and your attorney will give you a rundown of the closing costs, which include legal fees, appraisals, title work, and the recording and filing of various documents. You can shop around with various lenders during the mortgage process to see who has the best closing cost estimates, but as a rough guess, expect to pay between one and two percent of the cost of the home. The last few days before the closing date are also a good time to request a copy of the documents you’ll be signing on the day. These are usually standard form documents with slight tailoring to your specific home sale, so it’s fairly simple to get a clear idea of what they will contain well ahead of time. Review them carefully and ask your lender and attorney to clarify the details if you have any questions. Most of the time, you as the home buyer are responsible for paying your closing costs; just as you are responsible for the down payment. With that said, in some cases a lender may cover closing costs in exchange for a higher interest. Sometimes, Sellers can also contribute to Closing Costs and this would be negotiated at the time of your offer or after your inspection. Be aware that your lender may also require you to have the equivalent of anywhere between one and six months’ worth of mortgage payments in your account at close. Under no circumstances should you take out a loan to cover these costs or down payment. If you’re concerned for any reason about not being able to afford closing costs, contact your loan officer to discuss your options. You’ll need two forms of government-issued ID, such as a driver’s license and a passport. You’ll also need to bring a checkbook to cover any adjustments. It’s very common for costs on the day to be slightly higher than your estimate, due to last minute changes and fee calculations. Additionally, during your final walk-through and discussion with the seller, you may decide to purchase some optional furnishings, fixtures or other items which will be paid on closing. The closing will most likely take place at the attorney’s office of either you or your seller. Occasionally, you might close at the local Registry of Deeds office pertaining to your new home’s address. In addition to yourself, you can expect your attorney, the seller’s attorney and the realtor to be there for the closing. Your loan officer and the seller may or may not be present as well. Flex your fingers and prepare to sign you name, a lot! You can expect to spend around two to three hours reviewing and signing documents. After all the t’s are crossed and the i’s are dotted, you’ll need to settle any extra last minute costs for the closing as well as any changes you’ve agreed upon with the seller. Finally, you’ll get the keys from the seller or the realtor, and then the home is officially yours. Congratulations! While most closings follow a similar pattern and are relatively simple once you understand what’s happening, you should always feel free to use the resources on the HUECU website or contact HUECU staff and lenders directly at any point during the process with any questions you might have.